What a WINNING week this has been for Ma’alot!!! As one of our educational peulot (activities), we wanted to teach our chanichim (campers) what a Jewish wedding was like. So the two of us (Dani and Shai) got engaged!!! On Dani’s day off, Shai informed the chanichim that he wanted to propose and let them come up with the entire idea. Stay tuned for pictures from the wedding this coming Tuesday! Wednesday night was super eventful for aydat (unit) Ma’alot!! The peulat erev (evening activity) was KTV, where each aydah gets a theme that they have to pick a song to lip-sync to. Our theme was foreign songs. The banim (boys) made a skit about tourists traveling around the world and came in third place!!! And, the banot (girls) performed a hilarious skit about the Beijing Olympics and came in first place!!!! 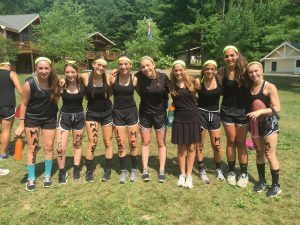 Thursday we had a truly achla yom (awesome day) beginning with powderpuff, an all-girls football game that takes place every year between the Ma’alot and Levi’im banot. It was a very close game, which was a tie. But, we went into overtime, and we CAME OUT ON TOP!!! This year, chanicha Daniella H. rocked the game by scoring both touchdowns. All of the banot had an incredible time (especially when we jumped into the agam afterwards holding hands). 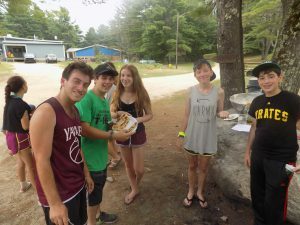 The afternoon was filled with a camp-wide food scavenger hunt where chanichim had to complete activities such as finding M&Ms in pudding, building a graham cracker tower only using fluff, and spelli ng out letters out of pita dough and cooking it. This summer really seems to be flying by because we are having so much fun!! Looking forward to checking in with you soon!